$1.25 million won’t just buy you this home at 100 Old Lake Street in West Harrison, New York, it’ll buy you a piece of history (h/t CIRCA). 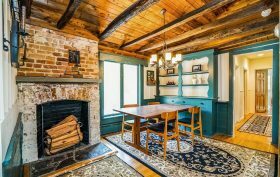 According to the listing, the oldest portion of this pre-Revolutionary War home is said to have been originally built in 1730 by Captain William Shelley and his brothers–they fought at Merritt Hill, the site of the Battle of White Plains, during the Revolutionary War. The house has since been expanded and modernized, although the building still has its original structural details.